This is truly a unique Hobé brooch - shaped like an arrow with a curve in the shaft. 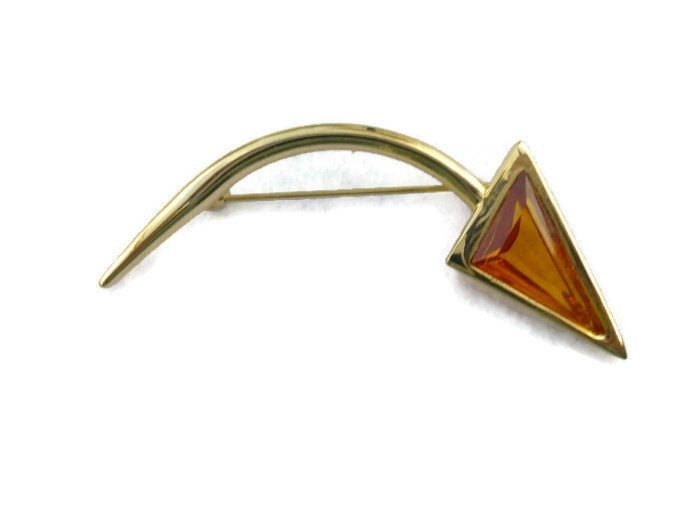 The head of the arrow is a bezel set unfoiled amber colored rhinestone. The brooch measures approximately 2-1/2" long by 1-1/2" and is in excellent condition. I was attracted to this necklace originally for the dog pendant and when the little pup arrived, I was completely delighted and enamored. He is beautifully displayed as the focal point of a very dramatic necklace composed of organic bone and horn beads and highlighted by just a glint of gold in the brass accent beads. The dog is delicate and intricately carved with a lovely patina and I could not be more thrilled. Thank you for carefully packaging my purchase to arrive in a timely manner and undamaged by the rigor of shipment. I will certainly be back soon.